Practicing and doing are not the same thing. A thousand kicks in the air is worth one good shot in the head. I think that's an accurate formula. Many of you who are reading this know what I'm talking about. Making mistakes, in the broad scheme of things, are good as long as we learn from them, i.e. don't repeat them. For some practitioners, making mistakes is equated with appearing foolish and creates anxiety. The root of anxiety, quite often, is having to face the unknown. Coming to know the task at hand enables us to make good progress, whatever the endeavor is. 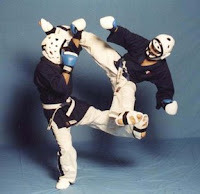 We learn, for example, that if during kumite we hold our hands too low, we'll get hit in the face. Keep your hands up! Or perhaps we experience a tightness in our body when we feel fearful, or inhibited while sparring. This greatly impedes our ability to generate speed and conserve energy; mental stress can be physically exhausting. So we take measures to learn how to relax. The ability to relax is crucial during moments of imminent danger; it allows our skills to come to the forefront. The dojo should be regarded as a laboratory, a testing ground. This is how we learn: not by trying to look good, or looking at the other trainees, but by looking at and within ourselves. I'll say it again, mistakes are good. And not to sound metaphysical, but I take the position that all things happen for a reason, sometimes those events that we perceive as bad. Trial and error is a big part of the martial way. A good budoka is one who stumbles occasionally, but never quite falls. I couldn't agree more that learning is by trial and error, and it's better to practice and practice until you get it right in the "comfort" of your learning place, or dojo. My board breaking is an example of that. It took me FOREVER to get an elbow break and I thought I'd never get it down. I avoided side kick breaks because I had problems, but after an intense workout on basic kicks (not even on boards), I started realizing the problems with my momentum, and sure enough, after at least 2 months of avoiding it, I was able to do that side break more quickly than I ever had. I'm still learning which side is stronger with my side kick to feel comfortable with it, but that's because I'm in the "safety" of my own school, where I know I have the support to help me work out the kinks of my methods. According my my Sifu, the Chinese believe that you need to do something 33 000 times before it becomes a reflex! That's a lot of practise. He also taught me that the ego gets in the way of learning. It's the ego that's afraid of mistakes and when you're afraid of mistakes, you become afraid to try and, as you point out, to 'face the unkown'. Isn't it funny how children just don't seem to have this fear - they just go for it and don't care what they look like when they try that cartwheel or that handstand. Maybe we should approach our training like that. Finding the fun in making mistakes! hy, very interesting site you have, I am not a practioner of martial arts, but a great fan of Chuck Norris, his book on Zen is just great, it´s good to know that such skilled persons like you or Mr. Norris, make their thoughts on ethics and the philosophy of martial arts and life in general. 33,000 repetitions -- that sounds like alot of work! But as serious as the martial arts are intended to be, sometimes it really helps to approach them (and other aspects of life, for that matter) with a light-hearted "childlike" (not childish) disposition. Thank you, Arash. Chuck Norris, in my opinion, presents the martial arts in a very positive way. Another good writer on martial philosophy, ethics, and Zen is Joe Hymans (he co-authored at least one book with Norris). I like the focus of this addition to your weblog. I've seen the results of people who practice alot, but are practicing improper movement so that when it comes time to use the technique they actually hurt themselves. I'm glad that you are alerting us to this! Make them, breathe in, train, correct, repeat. Another mistake? Breathe in, train, correct, repeat. and repeat and repeat and repeat. Funny, now that I'm writing these words, I remember myself saying something like : woah, how can they repeat the same things over and over again without getting bored? Thanks Tangy Apple. I'd like to see those pics. And speaking of Chuck Norris, has anyone seen these humorous "Chuck Norris Facts" sites? They're pretty funny, and I'm sure Norris is a good sport about it. Who starts these trends? LOL... If you go to Chuck's website, you can buy a Chuck Norris t-shirt that has a cool pic of him with the words "The Fact" over it, so I think he must be a good sport about it! My friend and classmate sends everyone on his mailing list a "Chuck Norris Fact of the Day" always worth a good laugh. In skiing it's said if you don't fall down you aren't trying hard enough. Years ago I heard Jim Mather talk about learning repetition. He said it takes 1000 repetitions to get a move, 10,000 to be competent, 100,000 to reach black belt proficiency and at least 250,000 repetitions to get to world class level. That's for each move. While that sounds daunting, imagine doing 1000 punches a day. You could have a world class punch in a year.